Scarcely taller than the vine from which she is picking grapes, Fatima, a Moroccan woman in her 50s, squints as she peers into the sun shining on the open plateau near Meknes. With only a few more rows of vines left, the grape harvest is almost over and she will be moving on to picking olives. Fatima and a handful of the other agricultural casuals bridge the gap between the end of the nectarine and the start of the olive seasons in the acres of vineyards just outside Meknes. But Fatima has never tasted wine - she says it is too expensive. Nor does she realise that her job is at the cutting edge of commercial moves to sell Moroccan wine to distant markets. Chateau Roslane, a sprawling property of more than 2,000 hectares (5,000 acres) belongs to the country's oldest winemaker and boasts Morocco's only Appellation d'Origine Controlee (AOC) - a French system which guarantees that wine has come from a specific geographical location. It also produces a Moroccan "champagne", a sparkling wine made according to the Champagne method and which is sold locally. But like the other handful of growers in Morocco, the owner wants to concentrate on exporting the red, white and rose, despite a healthy domestic market. According to Les Celliers de Meknes' Belgian export manager, last year the company saw real growth, especially from new markets. "Our production grew by over 12% and our biggest emerging markets are India and China," says Jean Pierre Dehut. "This is likely to deprive European producers of some of their anticipated growth in these areas." He also predicts that the extra hectares being planted with vine seedlings will be eclipsed by the speed of growth in the market. "Unfortunately we no longer have any indigenous Moroccan varieties," he explains. "We use grape varieties from the Mediterranean basin." Wine has been produced in Morocco for thousands of years, so it does not touch the raw nerve it would in Saudi Arabia, for example. It is sold in a separate section of the country's largest supermarket chain, with specific cash tills dedicated to all transactions involving alcohol. The first evidence of wine production in Morocco was in the time of the Phoenicians - the first millennium BC. Prized by the Romans, the strong wine was sent back to Italy. During the years of the protectorate in the early 20th Century, the French colonised the Meknes region in the foothills of the Atlas Mountains, planting hundreds of kilometres of vines to satisfy the need of compatriots living in the North African country, but also for consumption in France. Until the Treaty of Rome in 1957 banned blending wines, the highly coloured, robust Moroccan wine was shipped back to France in bulk and frequently added as a boost to Gallic wine. After Morocco gained its independence, King Hassan II offered parcels of land in the 1960s at knock-down prices to foreigners so they would continue wine production. Some French took up the offer at the time and others are now purchasing vineyards taking advantage of low land prices, manpower and transport costs. But in return buyers have to comply with a "Cahier de Charges", a list of responsibilities that include employing a certain number of local people. 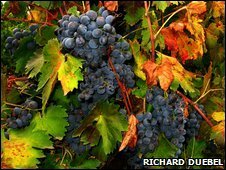 Wine-growing, categorised along with other agricultural products, is tax-free until 2012, providing the farming is not on an industrial scale. Members of ASPRAM, the Moroccan wine-growers association, buy a percentage of their grapes from local growers so as to remain within the scope of the law. Mehdi Bouchaara, a member of ASPRAM and director of Les Celliers de Meknes, says that Morocco is currently producing 300,000 hectolitres of wine each year, making it one of the most significant in the Arab world. "At the moment we are in negotiations in China and will shortly be building a bottling factory there. Most of our wine is exported in bulk," he explains. "With our Chinese partners we will put it in bottles that bear a Moroccan label." Currently only about 1,000 hectolitres are exported, but with a foothold in China, there is a chance that the record of almost 300m hectolitres clocked up during the French protectorate could be matched or even bettered.